I recently posted that I can see Africa from my terrace, and that seemed to cause a frisson of excitement around the globe, so I thought I would give you an even better view! 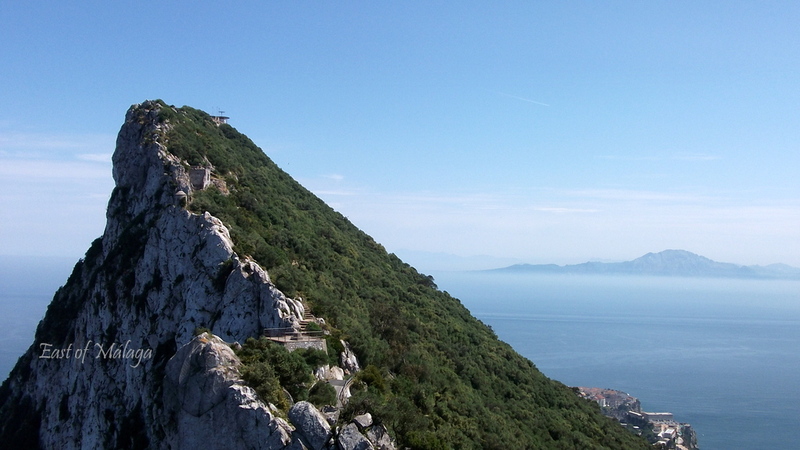 On a recent trip to Gibraltar (less than a three hour drive from my home), with a friend visiting from Australia, we arrived at the top of The Rock to see the magnificent sight of another continent just 8.9 miles across the water. AFRICA! This is the stunning view that greeted us at the entrance to the Mediterranean Sea, with a backdrop of the mountains of Morocco, including Jebel Musa, the other Pillar of Hercules – the name given in the ancient world to the promontories that flank the entrance to the Strait of Gibraltar. I glanced over to my right, to take in the Spanish mountains dropping into the sea, and when I looked back this little guy was posing for me! He´s a Barbary ape – Europe’s only wild monkeys. 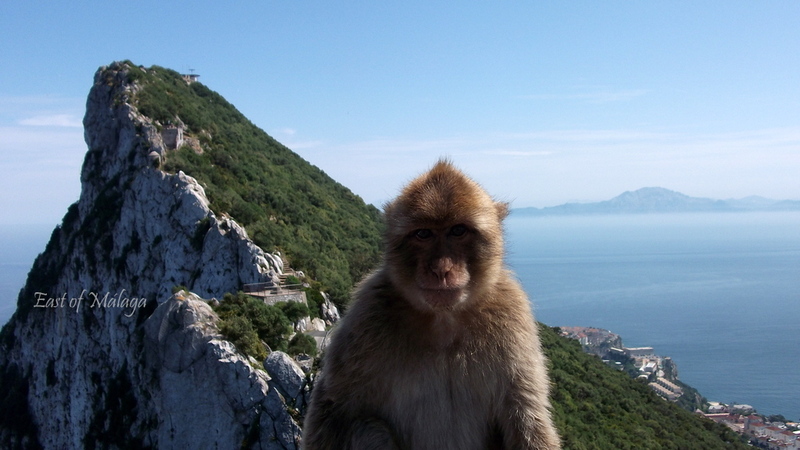 Local legend has it that as long as the Barbary Macaque population exists on Gibraltar, the territory will remain under British rule. I just had time to take this perfectly posed image and, just as he appeared, quick as a flash he was off to join the rest of his friends! This entry was tagged Africa, Barbary ape, Europe, Gibraltar, history, photography, Spain, Sunday Post, Weekly Photo challenge. Bookmark the permalink. I´m glad you like it, Ewa. haha … the Barbary ape looks like he just woke up. cute ..!!! Looks so like the same monkey that stole my nuts when I visited Howlett’s zoo in Kent! So cool! Just like the crowds who also get in the way. That would be good only if they are as cuddly as him. He’s smiling too. Aces! He´s smiling because he´s posing! Some of the group we were in had the monkeys climb on them and other took photos, but I didn´t want to do that as it encourages them into bad ways. Love the photos! And what a great view! Thanks – and if you ever get the chance to visit Gibraltar, I would recommend you take a trip to the top of the Rock for the amazing views! It really IS quite a mesmerizing sight, isn´t it? Yes – I´ve been up Mount Teide too – it´s a great view! Not that I recall …..
Wow, that’s incredible! Thanks for posting Marianne. I’m glad I checked back to find this. It was our chat the other day that spurred me on to do it! There can´t be many places in the world where you can see another continent so close by. You have an amazing life! So let’s marinate ourselves in olive oil and other sauces – at least we’ll sort of taste nice and tender when they arrive. Hmmm, garlic or rosemary infused oil, so many choices sooo little time. haha sounds adventurous that recipe with the thread beginning with a monkey? Great challenge this week, Jake. Thanks. It was certainly quick, opportunistic and very lucky! Thanks Madhu. Yes, a fantastic bonus! Tailor made for the challenge – what a fantastic view, and cheeky monkey sure is cute! Thanks. Glad you like it (and him)! How very obliging of him! I think he´s done it before. That cheeky little monkey is sooooooooo cute! He didn’t try to mug you, did he? Hahaha – no, not on this occasion. Bear in mind I´ve been to Gibraltar a few times before, so I´m wise to their tricks. Oh good, do you’ll wear them as gloves before they can even think about nabbing your bag. Good for you! What about squirrels? they’re all in it together – they will eat us and once more majestic will be theirs and only theirs!